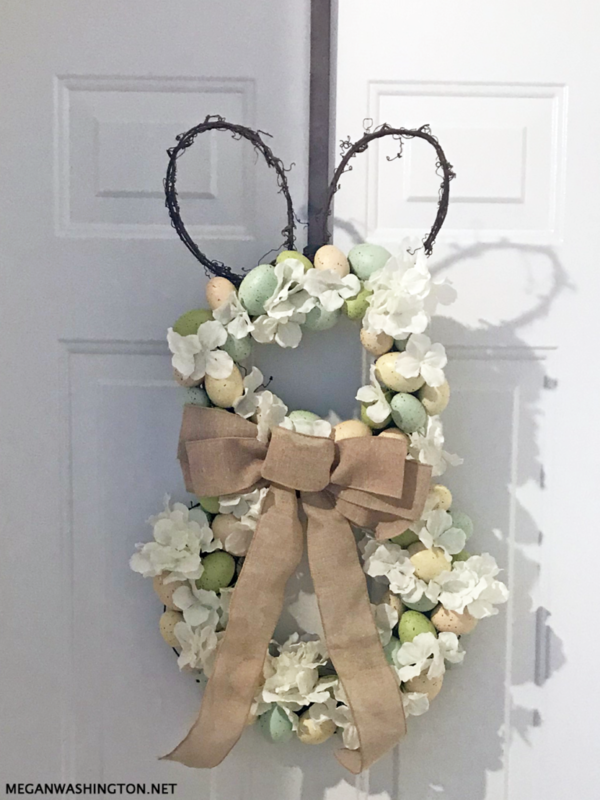 I had gone for tea with a friend one day and noticed that there was a super cute Easter Bunny wreath on the shop’s front door. I took a picture and sent it to my friend Riley who immediately jumped on the idea to create our own. Riley loves crafting just as much as I do and has some amazing ideas so we put our heads together and came up with a plan. We went to our local craft store to pick up some supplies. I used about 5 bags for the smaller bunny that I made and about 7 bags for the bunny with the bigger belly. Yes, I made two wreaths–one for myself and one for my nephew. 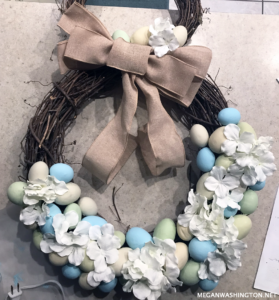 With the wreath for my nephew, I wanted to incorporate some blue so I hand painted the eggs to the specific color that I wanted. I would note to pay attention to the finish on the eggs that you are using if you wish to paint them to meet your needs. I used a matte paint but you may want to use a satin or gloss. 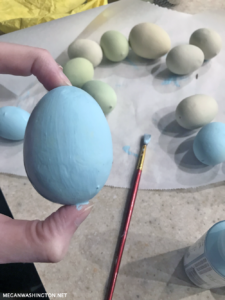 There are several different egg packages to pick between at Michael’s craft store but for the one bunny I chose the speckled look and for the other I chose the light solid color look. While your eggs are drying, should have you have needed to paint any, you can start fixing your bunny pieces together. Use your crafting wire to secure the head and the body together. Next, take your small portion of grapevine and shape your ears. Secure those onto the bunny’s head using the crafting wire. Next, take your bow and put add that to your bunny. 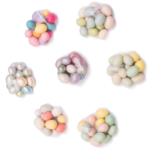 It is easier to do it now so you do not have to work around any eggs or flowers–potentially knocking them off. Add some wire to the back of your bunny’s head so that way you will be able to hang it without the door hanger not fitting on the head or having it knock some of your decorations off. I went back and forth three times, making sure each time it was tightly wrapped and looped with the other strands for the most secure hanging. Now the fun part really begins! 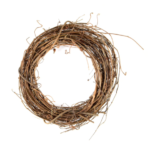 You’ll be able to start putting your eggs and floral pieces on your wreath. I chose to weave the flowers in and out of one another so there was color and texture. When you are finished, depending on the colors and sizes that you use, your bunny should look festive and ready to show off! The smaller bunny took about two hours to do. 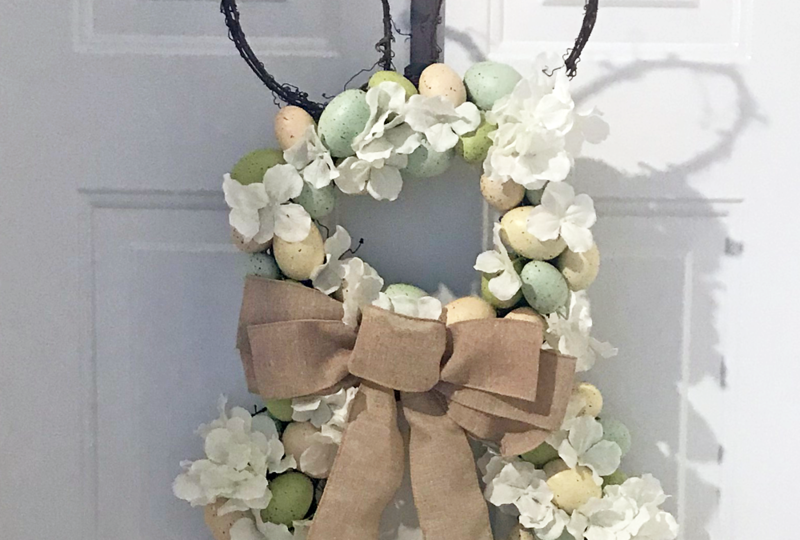 Total cost was around $40 for the wreaths, eggs, flowers, wire, bow and door hanger.